Tanda and Xero have a live API connection, so you can export your Timesheets to Xero automatically. Xero is configured for Payroll: you can check out the Importing Staff from Xero article for detailed information on this if you haven't done this yet. If you're on a Tanda Managed Award Template, you have completed the Payroll Configuration: Integrating the Managed Award Template step. For Salaried staff, even though their Timesheets won't be exporting to your Payroll system, you can still have them in green and export them along with the other Timesheets, they just won't show in the confirmation summary or export file. If they have applied for leave or have allowances on the said pay period, these will be included. Check Timesheet Export Summary: you can click on each employee's name to check the Award calculation. Check Total Hours and Gross Wage: at the end of each employee you can see the total for the pay period. Provided you have no errors, you would then just go into Xero. Double check the gross total's for each employee are correct with the Total Cost in Timesheets > Weekly Timesheets or the Wage Cost Report in Tanda. Xero doesn't let us delete or add a second timesheet for an employee for a pay period, so it has detected that a timesheet already exists - either created manually in Xero or exported from Tanda previously. If the timesheet in Xero is correct, then you can ignore this error and process as normal, however if you need to make changes, you'll need to delete the timesheet in Xero and then you can re-export. To delete a tiomesheet from Xero, go to Payroll > Timesheets. Select the relevant timesheet or use the filters if you can't see it in the list. 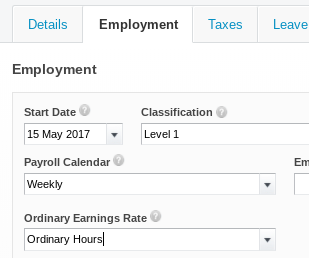 Back in Tanda, you can then try exporting again by clicking Export to Payroll in the Weekly Timesheets page or in the employee's individual timesheet. This means either the employee hasn't been added to Xero or the profiles haven't synced between Tanda and Xero. First, check that you have added the employee to Xero under Payroll > Employees. Add them if they weren't in your Employee List. An employee's profile is synced between the two systems if you can see the name matched below Employee ID. 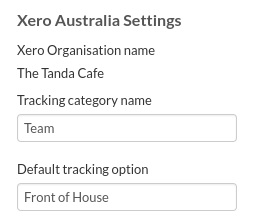 In Tanda, if you can't see the profiles synced (as above), go to Workforce > Staff > Add Staff > Import from > Xero. The confirmation will either say that the employee has been imported or updated. You can then check in their profile to see it is now synced and re-export the timesheet. If the profile is synced, check in Xero that their Start Date, Email Address and spelling of their name is the same in Tanda. These includes the spaces and capitalization of the name of the employee. If any of these are different, update and then try importing the employee into Tanda again. If you have located the issue, you can then try exporting again by clicking Export to Payroll in the Weekly Timesheets page or in the employee's individual timesheet. This can occur with both the Tanda Managed Award Template and Custom Rules. In Xero, go to Settings > Payroll Settings > Pay Items. Check the relevant Pay Item or create it if it wasn't there. Once you've selected the correct export name, make sure to choose what type of Award it will be: Custom Payroll Setup if the said award rule was manually created or rge award template that you have enabled in your account. If you have located the issue, you can then try exporting again by clicking Export to Payroll in the Weekly Timesheets page or in the employee's individual timesheet. This is either caused by the employee not being classified on the Award Template or Custom Rules or a Pay Item in Xero not having a Type of Units as "Hours". If you can't select an Industry Award in the employee's profile, ensure you have enabled the award in your account first. You can then check this in Xero, it might show as --- Restaurant - Base Hourly. For staff with Custom Rules, you will have to manually select in Xero as above, generally it is Ordinary Hours. 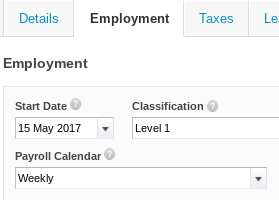 This means that the payroll calendar in Xero doesn't match the timesheet pay period in Tanda. Both systems must have the same start date and period length, i.e you can't run fortnightly timesheets in Tanda, but weekly pay runs in Xero. If they don't align, you can either contact Tanda Support on the details at the bottom of this article to change the pay period in Tanda, or you can create a new Pay Calendar in Xero to align with Tanda and assign to all your staff in Xero and then try re-exporting. The majority of the time, this can be fixed by disconnecting and reconnecting your Xero account from Tanda. Go to Settings > Add-ons > Payroll & Accounting. Click on your Xero integration and in the bottom right corner, click Disconnect Integration. You'll then be prompted to enter your Xero login details or if you're already logged into Xero in another browser, give Tanda access. When it loads back to Tanda, just click Save in the bottom left corner. You can then try re-exporting your Timesheets. If this does not fix the issue, Xero may be experiencing a fault or doing maintenance on their API, meaning Tanda cannot communicate with your Xero account. For more information you can check the Xero Platform Status page, which will inform you of any discovered issues in their API. If the status page indicates no issue, the issue may as yet be undiscovered on the Xero end, or an issue with Tanda communicating with your Xero account. If you're using Tracking Categories, ensure you have set this up correctly in Xero by checking Xero's help article. Check that the spelling is the same in each system and update if necessary. If you still get the same error again, you can allow one of our Tanda Superheroes to have Payroll Admin Access to your Xero account. You can shoot the team an email at support@tanda.co so someone will be able to assist you.